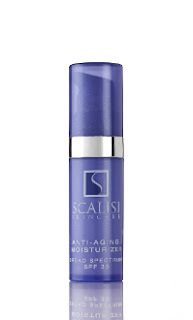 We recently tried a product by Scalisi , their Anti-Aging Moisturizer. We got a purse size of this product along with a cute little stretchy headband that I've been using to keep my hair out of my face while I'm washing it. It's like getting a spa treatment in the privacy of my own dirty little bathroom! Ha! Here's what the product looks like. It's a purse sized little gem in a blue pump bottle. It has SPF 30 (win!) and you get .2 oz in this travel size for $20. Their website advertises that it's small enough for your purse, but large enough to last a week or two. A week or two of skin care- and just day cream at that- comes at a high price with Scalisi- does it measure up to the price tag? I'm not sure. It's impossible to determine whether a skincare product is for you, or if it will break you out, simply in a week's use. The full size is $110 for 1.7 oz. When we tried it, we noticed with one or two pumps we got enough for our whole face. It was white (probably from the SPF) and took a little while to rub in. We were outside in the hot sun, and didn't burn on our faces, so that's a good indication that it was working. It definitely felt good while being applied and was enough to sufficiently moisturize our skin. If you are already a fan of Scalisi, it's good to know they have a purse size of their products, but you will have to be the judge whether it's good enough to warrant a $20 purchase for a thimble size of moisturizer. I recommend contacting the company via their website and asking if they have a smaller size yet for sampling before splurging on the travel size. This product was sent to us for review by Scalisi. We were not compensated for this review. All opinions are honest and they are our own.